PASCAGOULA, Miss., Nov. 30, 2010 -- The U.S. Coast Guard has awarded a $480 million fixed-price incentive contract to Northrop Grumman Corporation's (NYSE:NOC) Shipbuilding sector for construction of a fourth National Security Cutter (WMSL 753). Construction and delivery will be performed at the company's Pascagoula facility. 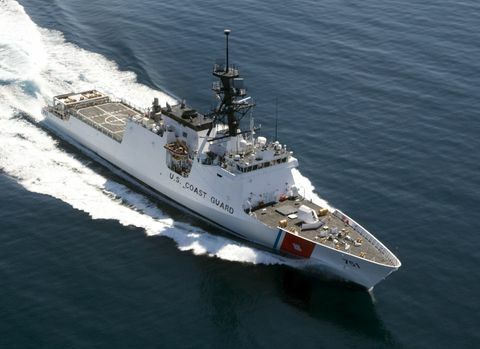 "These ships are a significant part of the Coast Guard's recapitalization program," said Irwin F. Edenzon, vice president and general manager, Northrop Grumman Shipbuilding-Gulf Coast. "This contract emphasizes the Coast Guard's confidence in the NSC's design and demonstrated performance, as well as the progress we've made with our quality and process improvement initiatives." The National Security Cutters that comprise the Coast Guard's Legend class are the flagships of the Coast Guard fleet, designed to replace the 378‐foot Hamilton class High Endurance Cutters, which entered service during the 1960s. The Legend -class NSC is capable of meeting a wide variety of maritime security mission needs. The cutter includes an aft launch and recovery area for two rigid hull inflatable boats, and a flight deck to accommodate a range of manned and unmanned rotary wing aircrafts. It is the largest and most technologically advanced class of multi-mission cutter in the U.S. Coast Guard, with robust capabilities for maritime homeland security, law enforcement, marine safety, environmental protection and national defense missions. This class of cutters plays an important role enhancing the Coast Guard's operational readiness, capacity and effectiveness.